Instagram influencer marketing entails partnering with Instagram users with large, targeted audiences to promote branded content, products, or services around business goals. Whether you’re a business-to-business (B2B), business-to-consumer (B2C), nonprofit, or service brand, Instagram influencer marketing can help you reach larger target audiences to attract and convert qualified leads. Instagram influencer marketing requires the use of in-house time and expertise to reap the greatest benefits. If you don’t have those in-house resources, consider expanding your team to a freelance Instagram marketing expert on Fiverr. 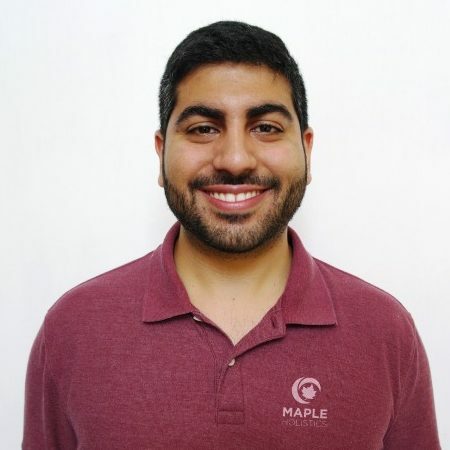 Via a simple Fiverr search for “Instagram marketing expert,” you gain access to a list of experts to help you develop and maintain your Instagram influencer marketing campaigns. Instagram influencer marketing begins with identifying your campaign goals and budget, then developing partnerships with influencers who can publish relevant content that appears before engaged audiences to help you reach these goals. Next, analyze partner-post performance to learn what works and what doesn’t, then apply these lessons to future posts. Lastly, use analytics to identify influencers who consistently help to meet goals and continue to work with them. Successful Instagram influencer marketing hinges on finding influencers within your industry that charge prices within your budget and publish content types that will help meet your business goals. For example, your goal may be to reach people in the consideration phase who are close to deciding to buy. If you’re on a tight budget, you might look for a micro-influencer with a highly engaged but small audience who often shares how-to videos. Micro-influencers charge lower prices and how-to videos give people the kind of information that helps them decide to buy. 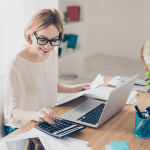 By pairing company resources and goals with influencers, a TapInfluence study revealed that companies stand to gain 11 times the return-on-investment (ROI) of banner ads, up to 10 percent more in purchases, and more money spent per purchase. A successful influencer partnership helps brands tap into targeted and high engagement for more authentic brand awareness that turns into loyal customers and conversions. Thirty-five percent of U.S. adults use Instagram. Seventy-two percent of them have purchased a product they first saw on Instagram. Given this engagement, business-to-business (B2B) and business-to-consumer (B2C) brands in manufacturing, tech, food and beverage, auto, travel, and marketing, as well as nonprofit causes, can benefit from tapping into Instagram influencer followings to drive brand awareness, consideration, and conversions. B2B Businesses – There are currently 8 million U.S. businesses represented on Instagram, making it prime real estate for B2B brands to market their wares before relevant audiences, including tech, manufacturing, and office supply brands, among others. Instagram influencer marketing helps these brands gain access to large audiences that will be interested in their products. B2C Businesses – With 72 percent of Instagram consumers purchasing products they learned about on the platform and 70 percent of high-use hashtags on the platform being branded hashtags, businesses that don’t market to consumers here miss out on market share, including those in the fashion, tech, food, and auto industries. Influencer marketing helps them tap into larger audiences for more impactful campaigns. Experience Businesses – A highly effective way of showcasing experience offerings is via visual assets like video and images. With Instagram being one of very few platforms that specializes in photo and image sharing, experience brands in salon, travel, and tourism, and outdoor adventure should be tapping into the very platform that highly engaged audiences turn to for visual content. Nonprofit Businesses – As Instagram is a video and image sharing platform, nonprofits in disease research, human welfare, political activism, and nature preservation should be represented on the platform; it is the platform most users turn to for visual storytelling. Instagram influencer marketers help these brands tell visual stories before large, targeted, and previously unaware audiences, and keep their attention long enough to trigger the emotions that drive donations. Service Businesses – Service brands in the graphic design, event planning, and financial health spaces must convince consumers they can perform a helpful task better than their competitors. This requires showcasing their processes and outcomes. Videos and images shared before highly engaged and targeted audiences help service brands showcase their competitive advantages they otherwise couldn’t have. Instagram influencer marketing begins with verifying that Instagram fits your target market, and outlining a budget and business goals. Then, brands identify and develop high-performing partnerships with popular Instagram users who can tap into the targeted and highly engaged audiences needed to meet those business goals. Doing so means growing the brand awareness and consideration that ultimately drives conversions. Gauging whether to use Instagram influencer marketing means deciding if it’s a good fit for your brand goals. This means examining Instagram audience demographics, your industry, and Instagram influencer availability to see if they align with the target audiences that can help you meet those goals. 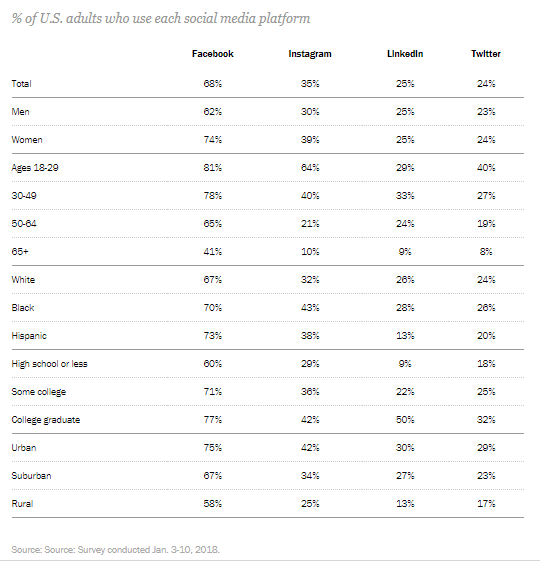 Instagram’s unique user demographic includes 64 percent of adults between 18 and 29, and 21 percent of adults between 60 and 64. It is made up of 30 percent men and 39 percent women, with the gender of the remaining user based not self-identified. In addition, only 29 percent of people with a high school degree or less use the platform, compared to 42 percent of college grads. Learning what demographics use Instagram and comparing them to your target markets helps you gauge whether Instagram is the right platform for your brand’s influencer marketing. An influencer engagement rate is the ratio of likes and comments influencers receive compared to the number of followers the influencer has. 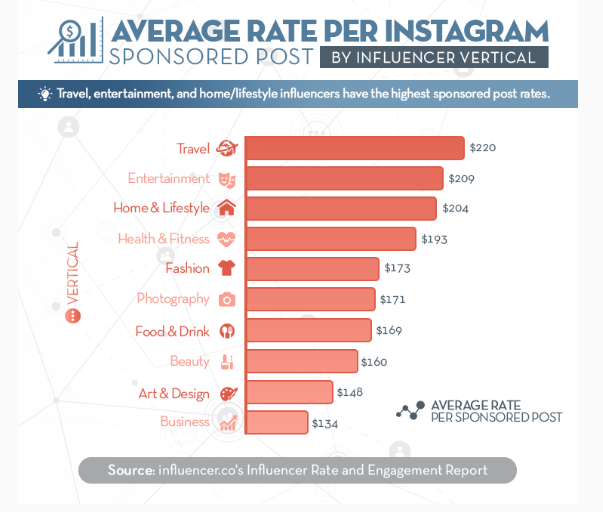 On Instagram, these rates vary by industry. 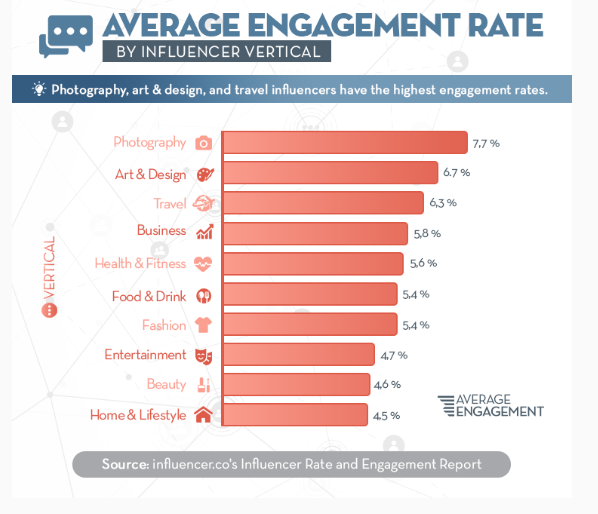 For example, the photography influencers receive an average engagement rate of 7.7 percent, while a travel or business influencer only receives 6.3 percent and 5.8 percent, respectively. Instagram influencer availability comes down to how often an influencer is interested in posting on Instagram. To gauge their preferences, Bloglovin surveyed 2,500 influencers to determine which platforms they’re most active on and why. They found that 80 percent use Instagram for posting organic content, surpassed only by blogs, but not other social media platforms. 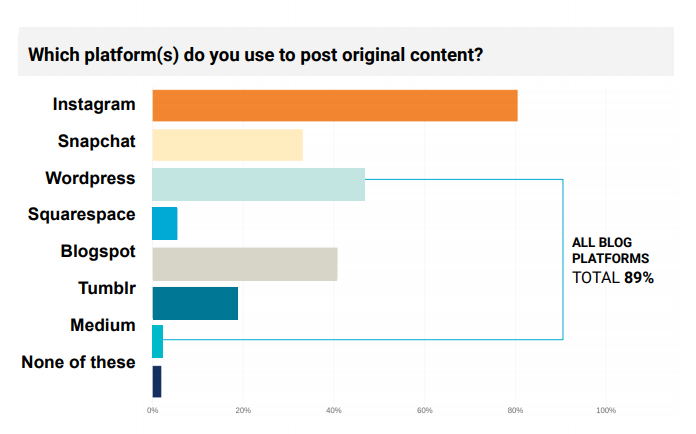 To answer why micro-influencers (influencers with between 5,000 and 50,000 followers) chose Instagram, they dug deeper by asking what social media channel they found to be the most effective for engaging targeted audiences. Fifty-nine percent of them chose Instagram, compared to just 18 percent preferring Facebook. Ultimately, Bloglovin showed that Instagram influencers are available and, in fact, are under-engaged. Only 47 percent of Instagram micro-influencers reported being paid to promote brand content. For brands, this means Instagram influencers are not overwhelmed with offers or work, and so brands are more likely to enjoy the benefits of an undersaturated market, including higher engagement among Instagram audiences and more reasonable rates. If you find Instagram influencer marketing isn’t right for your target audience, consider other social media platforms to market your business. Read our guide to marketing your business on Facebook. Influencer marketing can start at under $100 per post and go as high as $1,400 per post. Keeping costs within your budget means considering the average cost of an influencer’s posts; this is done by considering their number of followers, the average cost fluctuations by industry, and the average engagement rate by industry. By first understanding a ballpark estimate of what your post will cost and the impact it will have, you can gauge if you’ll need to purchase more posts or simply boost your own posts for engagement. You can expect to pay for influencer posts based on the number of followers the influencer has. For example, you can expect to pay an average of $133 for a branded post published by an influencer with 10,000 to 25,000 followers and $1,405 for a post published by an influencer with 1 million or more followers. But, in between, there are savings opportunities. While you can expect to pay $137 for a post published between 2,000 and 5,000 followers, you may pay $93 for a post put before 5,000 and 10,000 followers. Consider the influencer’s industry and how prices should fluctuate accordingly. For example, the average Instagram influencer post for a travel agency is $220, while the business industry averages $134 per influencer post. When you begin negotiating prices, it’s best to start at the average post price per the influencer’s follower count, then increase or decrease it by where the influencer’s industry falls in the cost spectrum. Now factor in what you’ll get out of each paid post. Each industry’s influencers earn an average engagement rate. For example, business industry influencers enjoy an average engagement rate of 5.8 percent. So, if you pay for a relevant post to publish before an audience of 2,000 followers, you can expect engagement from 116 followers. If you want more engagement, you’ll have to pay for more posts or pay to boost your post by about $5 per 1,000 impressions. Many influencers already have brands and content they work with. To find them, you can follow their accounts, investigate popular brands that use influencers, or search an influencer database like Influence.co. We recommend you first create a good list of relevant influencers with all three methods, then narrow them down by campaign goals to find the best fit for you. Free tools can help you identify trending hashtags and the influencers who get the most engagement out of them. For example, Brand24, Buffer’s free Instagram monitoring tool, allows you to identify trending hashtags in your industry, then filter for influencers who use them based on their follower counts. 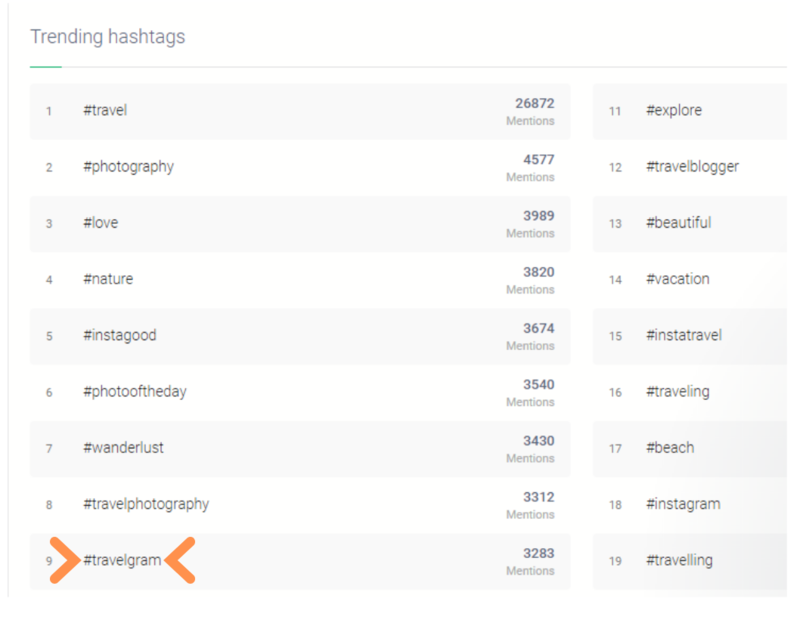 For example, after logging into my Brand24 account, I searched for the keyword “travel.” From there, I clicked on the “analysis” right-hand menu option, and the tool revealed #travelgram to be a top hashtag in the industry. By clicking on the #travelgram, I was presented with a list of people who mentioned this keyword and the content they paired it with. 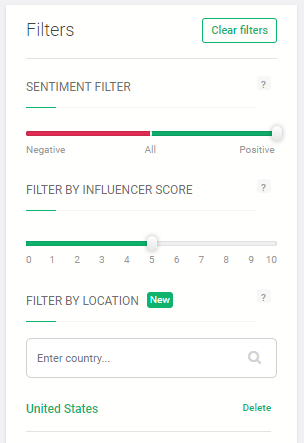 Next, I filtered the results to only include the Instagram platform, a positive content sentiment, content from my country, and the follower counts of the people who mentioned it. I didn’t filter to the highest follower count to keep my list of Instagram influencers within a small business-friendly influencer post cost. By finding industry-trending hashtags, then filtering them by the Instagram platform, sentiment, influencer reach, and location, Brand24 curated a list of hashtag mentions by micro-influencers. At this point, you can create a list of relevant influencers who are engaging with the trending hashtags in your industry and are likely to charge prices within your budget. Another free tool to help you find industry influencers is Influence.co., a platform where influencers create profiles so brands can reach out to them. Influence.co also allows you to filter influencers by location and follower count to narrow in on your budget and by target audience. To identify your campaign goals, you first need to assess the types of objectives you can accomplish via Instagram influencer marketing. Instagram influencer marketing can help your brand reach goals that align with each customer journey phase, including the awareness, consideration, and conversion phases. Review the types of objectives you can reach using Instagram influencer marketing at each phase to decide which ones are important to your brand. At this point, people don’t know about your brand, products or services; your job is to make them aware. This phase’s objectives include brand awareness and reach. Brand awareness increases how many people know about your brand by putting your products before new audiences likely to be interested in them. Reach means showing your post to as many people as possible to spread brand awareness. At this phase, people know your brand, products, or services exist, and now are comparing your products to competitors to ultimately make a choice. Objectives at this phase include increasing traffic, engagement, app installs, video views, lead generation, and messages. 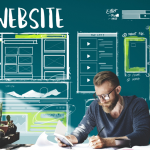 Traffic – Increase the amount of people who visit your off-social online properties (like your website) to introduce people to more information about your products or services. Engagement – Get people to reach out to your brand for more information or for 1:1 conversations that deepen trust and loyalty. Free App Installs – Get more people to install your apps and, thereby, become a regular part of potential customers’ lives. Video Views – Help people access more information about your products, services, or brand by watching branded videos. Lead Generation – Entice people to share contact or identifying information with you so you can continue to market to them. Messages – Get more people to engage in 1:1 direct messages with you to thereby begin building their trust and loyalty, and offer them more information about the products or services they’re interested in. At this phase, people have considered your products and services and decided they would like to purchase. Your job is to usher them through the purchase process. Objectives at this phase include conversions, catalogues sales, and store visits. Conversions – Drive people to take valuable actions that can lead to an immediate sale, like booking an appointment, asking for a quote, or signing up for a service. Catalogue Sales – Help people land on catalogues that cater to their interests and can be used to make a purchase selection. Store Visits – Entice potential customers to your online or brick-and-mortar store where they can make purchase decisions. If you haven’t already done so, running a funnel analysis of your website can help you pinpoint what goals to prioritize based on what phases people are dropping out of. Then, once you’ve pinpointed the pressing goals your business needs to reach, you can move on to step five to pair them with content that will deliver. For more information on how to conduct a funnel analysis, read How to Do Funnel Analysis in 9 Steps. With your list of influencers in hand, it’s time to begin pairing them with your campaign goals. But first, you have to pair your campaign goals with the content types that will help you reach them. For example, contests and giveaways help brands build awareness while reviews help to build trust and loyalty among leads in the consideration phase. Next, determine which influencers are available to engage in those types of campaigns. Contests and Giveaways – This content helps to build brand awareness, drive engagement, and spur lead generation. You can send out free products to influencers, who then arrange a giveaway among their followers. They can further expand awareness or lead generation by asking followers to share the post or follow you in exchange for an entry to win, or by providing an email address via a landing page. Branded Content – This is content created by your brand but features the influencer. You can create brand awareness before new target audiences by partnering with influencers that have followers in those target markets you’d like to expand into. Reviews – Reviews help to drive people from the consideration to conversion stage, build trust and loyalty, encourage engagement, and spread brand or new product awareness. Send your product to an influencer for an unboxing post, for example. To build trust, encourage the reviewer to be unbiased and completely honest about their assessment. How-to Videos – How-to’s drive brand awareness and consideration phase goals. Send your product to influencers and ask them to showcase how it works. A food brand, for example, might send their product to a popular chef influencer so they can use it in a how-to cooking video. Brand Rep Program – Like big brands, you can turn influencers you like working with into brand representatives that drive awareness, consideration, and even conversions. Provide influencers with a unique code and a tracking link so they can offer followers discounts. Then offer them a commission on sales they make. Sponsored Posts – These allow influencers to tell their own stories about your brand, and can primarily drive awareness, consideration, and conversion goals. For example, an event planning firm might pay the influencer to tell the story of the brand’s involvement in an event, then offer a call for people to book an event in the future. Now that you have a list of influencers, have pinpointed what goals you want to reach, and know what types of content can help you reach them, it’s time to pair content with willing influencers to meet set business goals. Having filtered influencers by hashtag helps you locate the content each influencer produces. From there, you can select influencers who already organically share high-performing content that aligns with your business goals. For example, on Influence.co, I filtered for travel micro-influencers with 5,000 to 10,000 followers. 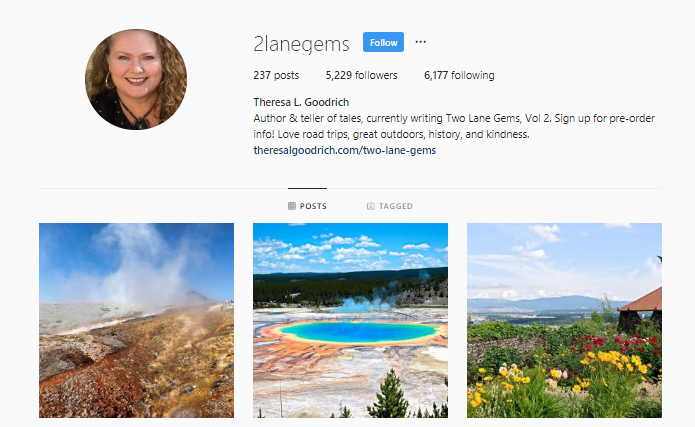 I found Theresa L. Goodrich (@2lanegems). From there, I clicked on her profile and found that she is a travel blogger who has written a book on road trips. She travels the backroads and chronicles her adventures via Instagram photography. A tourist guide could fit right in with her content, helping her to showcase her adventures via a professional guide. 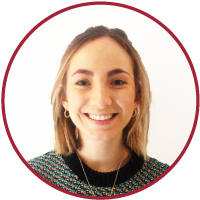 A tourist company could pair her type of content with awareness phase and even conversion phase posts by including a call to action to book a tour, for example. 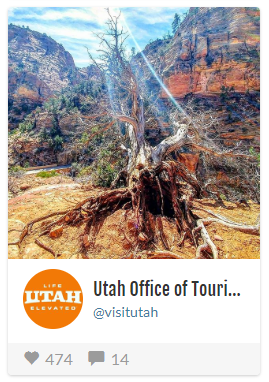 To illustrate, below is a post she did for a tourist agency. What conversion goals do I need to reach via influencer content? What types of content can help me reach these goals? Which influencers on my list organically share similar content that performs well? Write a list of key influencers that already share similar content. Then, reach out to them via an influencer platform like Influence.co or via direct messaging on their profiles. Simply ask them to review your products and let you know if they’re available to partner on influencer content. From there, you can negotiate rates and the creation process. When you pay an influencer to promote your brand, the Federal Trade Commission and Instagram require you and your influencer to disclose the paid relationship when publishing your content. Not properly disclosing the relationship could result in fines by the FTC. Some ways of complying with the FTC’s compliance requirements include the use of FTC-approved hashtags and their clear placement. The FTC has approved two hashtags for brands to use in disclosing paid Instagram influencer partnerships. They are #ad and #paid. You can use either, but many brands prefer to use #ad because of its short character count. It’s not enough to simply use FTC-approved hashtags to disclose a paid Instagram influencer relationship. You also need to make the chosen hashtag easy to find. Make sure to include your hashtag before the “…more” on your post captions. This means you must include your disclosure hashtag within the first 125 characters of your post caption. Instagram’s business accounts come with a branded content program that helps you make paid promotion relationships transparent, and they require you to use the tool when running paid influencer content. To do so, follow their step-by-step guide. In a nutshell, share your post, then click “Advanced Settings,” “Tag Business Partner,” and then input the profile name of your partner. While the FTC still wants you to use a disclosure hashtag, by tagging your influencer in your post, Instagram will display “Paid Partner” on your content to ensure greater disclosure transparency. If you have an Instagram business account (we highly recommend you convert it to one if you don’t), you can use branded content Insights to understand how your content performs. Instagram’s Insights are available to both you and your influencer so you both know what goals you’ve reached. Once you know if content performance meets your expectations, you can decide whether or not to develop a long-term relationship with your chosen influencer. Once you’ve tagged a business partner, you will have access to Instagram Insights, or post analytics, for 14 days. Your partner also has access to these analytics. Insights include taps forward and backwards, reach, comments, and exits. If your post isn’t performing as you would expect per the industry averages, don’t automatically assume it’s because the influencer wasn’t the right one for your brand. It could be that the post simply isn’t what the audience is looking for. To remedy this, if you have the budget, run two to three posts and track their performance to understand which performs better. Then, put more funding behind posts that are similar to the winning version. If you’ve run your post and tested it and you still aren’t seeing the returns you had hoped, you might consider trying out some different influencers, just like you tried different post versions. Track the performance of posts by influencer to learn which one helps you best reach your business goals. Then, consider developing a long-term relationship with high-return influencers. We reached out to small businesses that use Instagram influencer marketing to market their own or other small business brands. For best Instagram influencer marketing returns, their top tips for us were to track performance, tap into micro-influencers (see how above), and let influencers’ personalities shine through paid content. What Do Instagram Influencers Do? Instagram influencers have followings with which they engage around industry or niche topics. Most of them have cultivated a targeted audience and brands can pay them to share content that showcases their brands or products in a favorable light to reach set campaign goals. How Many Followers Do Micro-influencers Have? Micro-influencers are Instagram users with a following of 5,000 to 50,000. Because their followings are often gurus of a particular niche, influencers often run accounts with passionate, highly engaged followers. What Do Instagram Influencers Cost? Instagram influencer marketing costs can vary by industry, niche, and number of followers. However, the main difference in the prices Instagram influencers charge revolves around the number of followers they have. 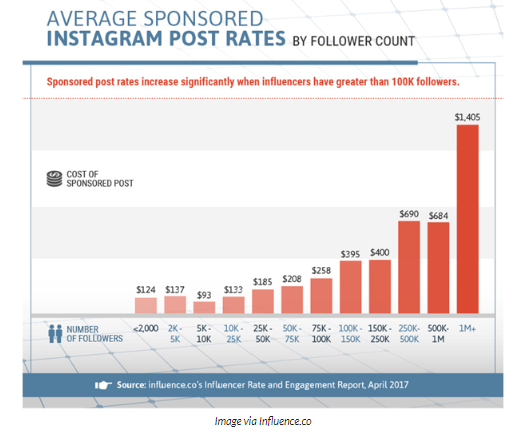 Brands can expect to pay approximately $124 for posts published by influencers with less than 2,000 followers and $1,400 for posts published by influencers with 1 million or more followers. What Are FTC Endorsement Rules? The FTC requires that any paid partnerships used to market products are disclosed as such. While Instagram Business has their own branded content process for disclosing paid partnerships, the FTC also requires you add either #ad or #paid to paid posts in the first 125 characters of captions. Instagram influencer marketing helps brands tap into highly engaged, large, and target audiences they otherwise could not have to drive brand awareness, consideration, and, ultimately, conversions. By choosing influencers based on controlled budgets and their ability to help meet campaign goals, B2B and B2C brands stand to benefit from a sustained increase in ROI. Small businesses may find investing time and resources in ongoing Instagram influencer marketing overwhelming. Fiverr can help alleviate that financial and time burden by offering professional Instagram influencer marketing management. A simple search for “Instagram influencer marketing” yields a plethora of 5-star Instagram experts who can learn your business needs, invest the time into finding and running Influencer campaigns, and then track and optimize results for long-term success. Thanks for mentioning influence.co! We have lots of free tools which might help your readers run their influencer marketing campaigns. We hope they check them out. 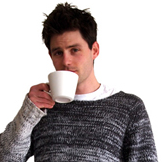 Also – let us know if you need anything else for future articles. We publish industry surveys regularly so we have lots of data. Thanks for sharing your expertise with our readers.